Coolum Police recently visited Peregian Beach Community reminding them to lock up, despite it being the holidays. Locals and visitors were provided with a range of information on how to keep themselves and their property safe during the holidays. 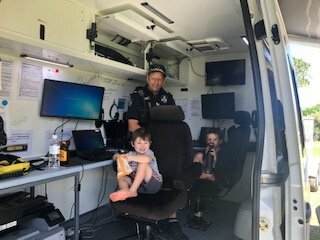 The high visibility Mobile Police Facility (MPF) attracted scores of people and kids to grab ‘who to contact‘ fridge magnets and pamphlets available about crime prevention in the Coolum Division. Officers also discussed a range of issues that members of the public had approached them about and advice was given about a range of options available. Some of the local children were given a quick tour of the MPF by Senior Constable Wray who just may have been doing some future recruitment whilst he was at it.